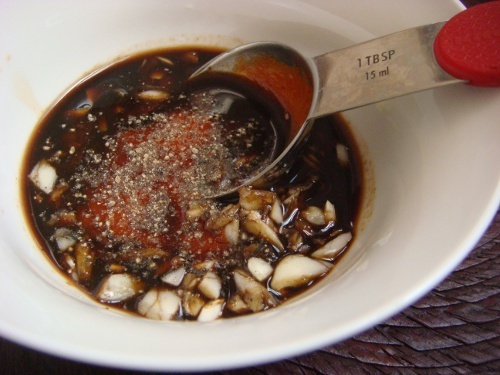 I’ve already talked about how much I like the little black dress of proteins and today I have another easy, healthy recipe for you. I’ve been seeing some good tofu recipes from some of my favorite bloggers in the last few weeks, and it reminded me that I haven’t made tofu in a while. However I also haven’t gone to the grocery store in a while so I decided to make do with what I have in my fridge and make a simple tofu salad. 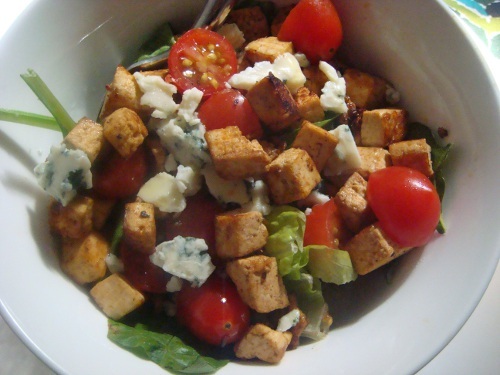 I just threw together a salad bowl brimming with a mix of spring greens and spinach, then topped it with some spicy tofu “croutons” plus grape tomatoes and blue cheese crumbles. Even though this was a salad bowl, this meal was still filling and comforting. 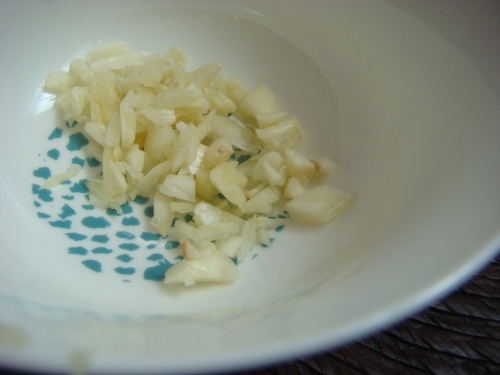 I know that the usual connotation of “comfort food” is heavy, hearty meals (mac and cheese, chili, roasts, etc) and I love those kinds of foods too, but I also often crave for healthier fare. Believe it or not, I don’t always equate calories with comfort. Also, I ate a chocolate bar after this salad. This was my first time eating tofu with blue cheese and I must say that I’m pleasantly surprised by how much I liked it (although really, I tend to like anything with blue cheese). I ate about half of the tofu and saved some for the next day, which I then ate with brown rice and broccoli (I ran out of barbecue sauce – booo). I did not eat a chocolate bar the next day. Really. I will be making more tofu dishes soon! And if you don’t feel like eating out and researching individual dishes at restaurants, well then you can always cook tofu at home. It seems to me that tofu is like cottage cheese – people either hate it or love it. 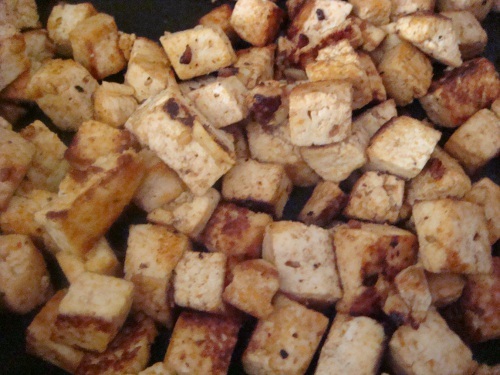 What do you think of tofu? 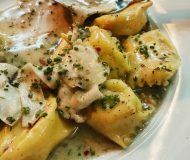 Any favorite recipes? 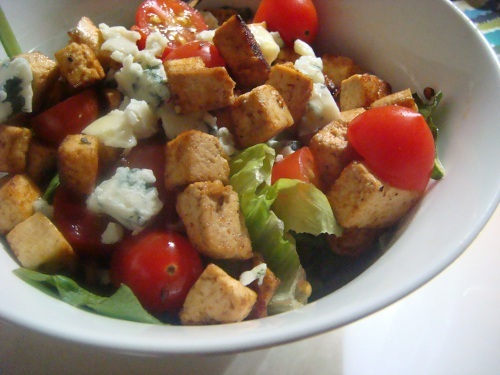 I’m a recent convert to tofu (hate cottage cheese though) – this is a great idea for a light and easy meal! Yummy, I love tofu!! I haven’t cooked it recently though. 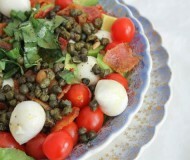 i absolutely love this salad! I love tofu! We make a lot of tofu stir frys, but I also love making mock “chicken” salad with tofu. One of my friends also just sent me a recipe for tofu parm that I can’t wait to try out! I like tofu. Just bought some tonight actually, thinking of adding it to some pasta salad. I am a tofu fan! I like using it in lasagna as cheese for a protein packed kick. I also like pan frying it for salads. It’s definitely really versatile! Oooh I have not yet used tofu in lasagna (or any other kind of pasta) – great idea! this sounds really good… it’s been awhile since I ate tofu as well… thank you for sharing this. I haven’t had tofu in a while but I like the way you cooked it and mixed it with all the delicious other salad components! LOVE tofu! And LOVE you for the shout out! 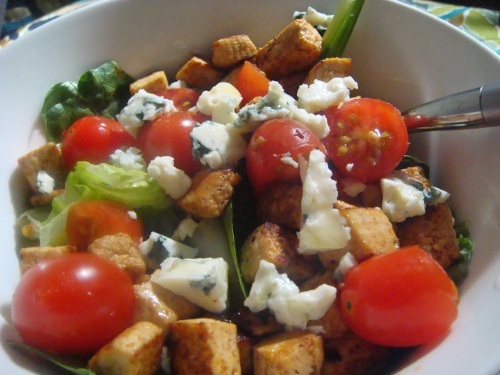 This salad looks awesome…especially with blue cheese! I wouldn’t need chocolate after that either. I’m a fan when done right :) Usually roasted is my go-to! 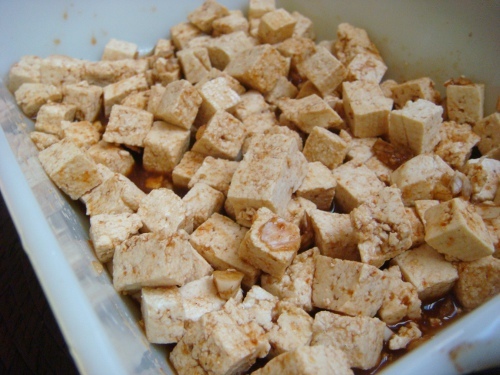 I’ve never tried marinating tofu before, but the one you concocted above looks amazing. I love anything with sriracha sauce in it though. I’ll definitely have to try this to switch up my usual salad scene! 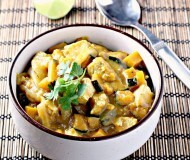 i love tofu but i have never cooked it, this is a great recipe. i also love tasted menu so so much, especially the perks we get to enjoy in the coming weeks. cant wait to see you!! 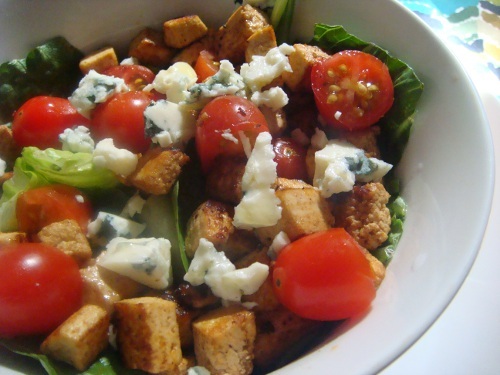 Thanks for the great idea for using tofu in a salad! I usually use tofu in stir fries, but will have to try using it in salads as well.